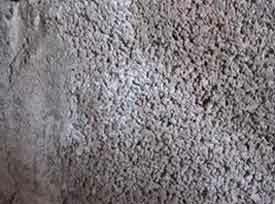 What is Efflorescence, and what is the cause of efflorescence, How do I treat salting on Plaster and brickwork, Tips for Treating Damaged Brickwork and Preventing Efflorescence. You may have noticed wall stains on your exterior brickwork and wondered "what are they"? If they are white deposits like the ones in the picture below then they could be caused by efflorescence. Efflorescence is one type of white deposit found on masonry. It is formed when water reacts with the natural salts contained within the construction material and mortar. The water dissolves the salts which are then carried out and deposited onto the surface by the natural evaporation that occurs when air comes into contact with the surface of the wall or floor. Sometimes Efflorescence is confused with spalling – this is damaged brickwork where the surface of the bricks starts to crumble because of Freeze/Thaw action, after it has become saturated in the winter months. 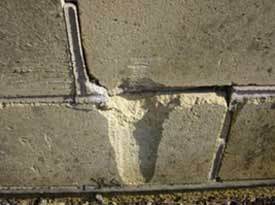 However this is a different problem to efflorescence (also known as "salting"). You can read more about spalling in our project on freeze/thaw damage. A definition for Efflorescence is a staining of brickwork, masonry and concrete, caused by salts being washed out of construction materials, and being deposited on the surface of building materials by the evaporation process of water. 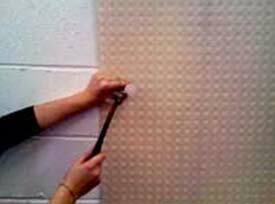 Efflorescence itself is not causing damage to the wall but it will damage any paintwork or wallpaper that you put over interior walls affected by efflorescence. Salting on bricks, and other construction materials, can also look unsightly on external walls. However this build-up of salts on the surface of the wall is a sign that the wall has been wet, so you will need to investigate what has caused the damp that has led to the efflorescence. What is the Cause of Efflorescence? You can find efflorescence on brick, concrete, or stone walls or floors. Efflorescence or salting can be found on fresh plaster too. Salting on fresh plaster can look white and fluffy. As mentioned above the cause of efflorescence is water reacting with the salts in the plaster (or other building materials) and can occur after a water leak, or where there has been a case of severe condensation. You can read more about how condensation can affect your home and cause efflorescence on walls, in our Condensation Project. Additionally, if you would like some extra help and advice on condensation, efflorescence and the causes of damp then you can call Property Repair Systems on 01626 336180. Preventing Efflorescence of Brick and plaster may not be possible, if it is caused by materials getting wet in the building process then you may need to simply allow the surface to dry fully and then treat the surface. If you have a leak or a high level of condensation then you can remove the cause of the moisture and treat the salts to neutralise them, and this is the only sure fire way of effective efflorescence prevention. If you have white marks on external walls it could be Efflorescence or Free Lime. Under normal circumstances white, fluffy efflorescent salt occurs in relatively new buildings because the brickwork was not protected from the weather during construction. The brickwork becomes saturated while the wall is built, and when finished this water finds its way out of the porous bricks in the wall by evaporation, it leaves the salts behind on the surface of the brick when it evaporates. Where this is the case the salts can be brushed off the wall and they should not re-occur. However, in cases where efflorescence is caused by a water leak, for instance where lead flashing is damaged, or masonry joints are missing, thereby allowing water to continuously enter the construction material, then efflorescence will continue to form. In this situation the cause of the efflorescence must be found and eradicated, because otherwise the unsightly salts will continue to form and more serious damage could occur because of the water ingress. The most effective treatment for efflorescence and free lime staining on external wall surfaces is time. The natural weathering of the surface will remove the staining if you are patient. If you have a serious build up of deposits on a wall, a good scrub with a stiff, dry brush will remove the worst, and then follow this treatment a soft dry brush to make sure you dust off all the salts from the wall entirely. 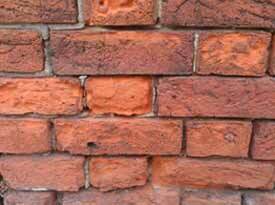 Mortar stains on brickwork can be caused by builders leaving residual sand and cement on the wall during construction. 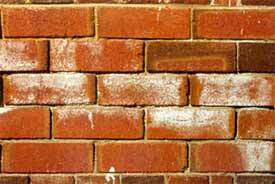 Unlike Efflorescence mortar stains are best dealt with by using a brick cleaning acid. These are available from most DIY stores and all Builders’ Merchants. You can apply the acid in diluted or undiluted form depending on the level of staining and then wash off, follow the instructions on the tub. Take precautions by wearing rubber gloves and a mask; acid is dangerous and should be used with care. For large lumps of mortar, a little gentle persuasion with a hammer and chisel will take them back to the surface of the wall, then you can give it a quick rub with a wire brush to take you down to the stain. The brick cleaning acid should remove the stain easily. Do not "attack" large lumps with acid. 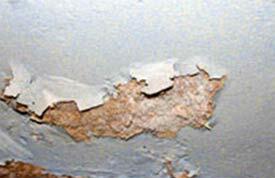 Efflorescence on plaster can cause white marks on internal walls and it can occur behind paint and wallpaper. These white, fluffy salts that are "crunchy" to the touch and where they occur beneath wallpaper or paint the crystals are strong enough to push these coatings off the plaster, we say they "blow" the plaster. This kind of sulphate crystal build-up can occur in any building, of any age, where water is passing into the structure. This water will find its way out of the wall through evaporation leaving the salts behind. The salts can be brushed off, but they frequently re-occur and damage the décor again. There is a treatment for efflorescence called Salt Neutraliser which you can buy from Property Repair Systems. The idea is to stop the remaining salts reacting with water and thereby preventing efflorescence forming. There is no more water passing through the wall. It is applied to bare plaster, render, stone or brick. It will not work if used on top of paint or wallpaper. 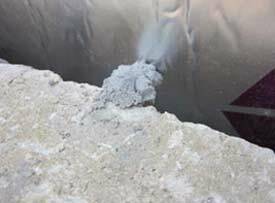 If it is efflorescence – other causes of white patches should be investigated and ruled out (see what is efflorescence above). Free Lime – the result of mortar or concrete curing, or from some clays used in brick making. Use a Membrane lining system which will protect the new surface from the salts in the materials beneath it. You can read more about using a lining system where you have an efflorescence problem on the Property Repair Systems website. Make sure you have allowed the area to completely dry out (use a dehumidifier if necessary). Sand down the area to remove all the salts from the wall, when you are doing this wear a mask to avoid breathing in the dust and wear gloves to protect your skin. You will usually find that the salts will come away easily with medium or fine sandpaper. However in severe cases start with coarse grit sandpaper and down to fine one, to make sure you have a sound surface before you redecorate. Wipe down the wall with sugar soap (make sure you mix with water to the manufacturer’s specifications) or you can use detergent and water. You can buy specialist efflorescence cleaner if you prefer but this is not necessary if you are using salt neutraliser. Once it is clean you should rinse down the wall with fresh clean water, to ensure that the wall is free from grease. As mentioned previously in this project guide, if you would like more help and advice on efflorescence, condensation or damp Property Repair Systems are available on 01626 336 180. All advice is free of charge and with no obligations.